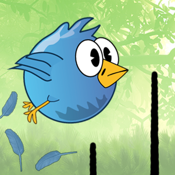 Guide these little cute birds through a world full of danger. Unlock new birds as you progress through the game. Each bird has its own special ability from getting invisible or using time warp to a powerful explosion ability. • This is the one and only original bird flying app! Feel free to post your ideas, we will try to implement them as soon as possible. Thank you very much for all your support in our games! We would love to hear your suggestions!